Kitsap Regional Library’s Jeannie Allen seems to be the EF Hutton of librarians. When she talks, we listen, because Allen has done a lot of listening over the years. 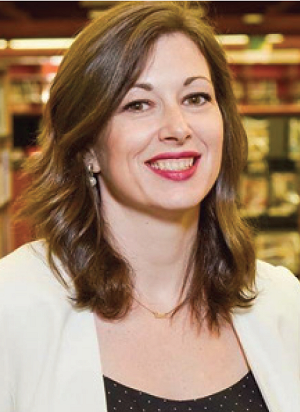 She built on this habit to propel her library to a John Cotton Dana Library Public Relations Award in 2014 and to a resoundingly successful levy campaign in 2017. Read this interview to see how Jeannie Allen connects, listens, and delivers to her community. Jeannie, tell us about your educational background. Although I don’t find much room for it these days, I still say I am an artist first. Working retail, I put myself through college, obtaining a Bachelor of Fine Arts in both fine art and graphic design at the Northwest College of Art & Design. My focus at the time was photography and painting, but I fell in love with design. After college, I spent quite a few years working in real estate, lending, and mortgage banking, always starting in sales and quickly ending up in the marketing teams. I’ve always been passionate about people and brands and was running my own small business marketing and design firm when Kitsap Regional Library found me and wooed me over to libraries. What is your marketing background? Do you have formal training, or are you an accidental marketer? I wouldn’t consider myself an “accidental marketer.” My degree in design gives me an edge; I understand communication both in words and how image and color can transform. A variety of jobs in sales have shown me firsthand the impact of good (and bad) communications. I have worked in everything from selling socks for large box companies to selling multimillion dollar properties for small, private developers. With each employer I’ve had, I am always curious, exploring how they talk to their customers, how they talk to their staff, and the impact of both—as an employee and a customer. Marketing is not numbers, data, or slick campaigns, it’s understanding people and how they think and feel. I am a research junkie. I can get lost for days exploring new audiences we are trying to reach or dissecting work we have just completed to learn more about what worked or didn’t. We have a department of five. Besides myself, we have a director of communications who manages community relationships and oversees all of our work, a web content specialist who crafts our voice and vision for everything online, a communications coordinator who is critical in keeping everything moving, and a graphic designer who is the master of every visual element of our brand. Additionally, we occasionally work with a contracted photographer and writer. We have around 175 staff for nine locations, a website, a bookmobile, and an outreach team. You can learn more on our Wikipedia page (https://en.wikipedia.org/wiki/Kitsap_Regional_Library). What percentage of the total organization’s budget is dedicated to marketing? This really depends on how you cut the pie! For 2018, our budget line for Communications is about $124,000, less than 1% of the library’s overall operating budget. It’s a serendipitous time for this question! This past November, our community voted on a levy proposition for Kitsap Regional Library … and it passed! The “campaign” was 5 years of strategically planning every step until the vote. Prior to my being with the library, there had been two failed attempts at passing a levy. The individual communities that make up Kitsap did not understand their local libraries were part of a system, and the library was not telling its story in a way that connected emotionally. In libraries, we may sometimes be poor in dollars, but we are rich with staff that are energized, inspired, and inspiring! Our library needed to clarify our “why” and simplify our message to empower staff with new tools that helped them better tell our stories—clearly and consistently. We began with a rebrand of the organization, creating a new mission, values, voice, and vision. Then, we built a new logo and a guide for how all these elements would work together. Along with the rebrand, we rolled out Inspire, a publication that was the catalyst for restructuring how Communications operated internally, shifting us from a department that was filling orders to leading a systemwide, strategic approach for everything. The final year before the levy was about creating a timeline of every possible thing we needed and sticking to it. Every staff person was activated and involved. The entire year was a continual loop of creating messaging, voicing it out, getting feedback from staff and community, and refining it. In our last attempt in 2010, we lost with 43%, and in November, our levy passed at 65%—almost doubling our community support. We are currently in the process of writing up the entire 5-year process so we can share what we have learned as a guide for others. Also, for 2 years leading up to the levy, the work of many of our staff was focused on building strong community partnerships. In the first year, we went through the process outlined by the Harwood Institute’s “Libraries Transforming Communities,” conducting more than 170 unique conversations with individuals and groups throughout Kitsap. We wanted to talk with groups that were not connected with the library. In these conversations, we asked what these populations wanted, not from the library, but for a better community. In the second year, using a model provided by EveryLibrary, we identified every single organization in our community in government, education, social services, civic organizations, and business, organizations whose missions were similar and where we overlapped in populations served. We prepared staff to have one-on-one conversations with peers and leaders in these organizations, having deeper conversations to better understand their missions and challenges, and begin conversations about how we could better serve our shared communities better together. Leading up to the levy, our staff were able to connect one-on-one with almost 80% of our community partners, leaders, and stakeholders. These conversations were not only critical in the development of our levy plan and communications, they have given us the tools to reshape our organization to best fit the unique needs of our community. And it has empowered our staff. We talk about the embedded librarian, but it is rare to sit down and really listen to our partners to better understand. It was the start of an open, ongoing dialogue with our community to create the best services possible. There is no single piece of advertising you can create that can replace the value of connecting, listening, and delivering on what you’ve heard. Keeping everyone—staff and supporters—informed, engaged, and excited for a full year. It has been my experience with long-term projects where you engage staff, you have about 18 months before the momentum falls flat. Although the official launch of the levy to staff was about a year before the vote, there were various elements of the levy that a large percentage of staff had been working on for years, mainly the conversations we were having out in the community. This work was critical in preparing what we needed to be successful, but it created a kind of “levy fatigue” for these staff. The levy and its importance were referenced often. In the last 4 months leading up to the vote, we really needed full energy and engagement. In the staff that had been engaged the longest, I noticed a loss of focus and engagement in our final push. If I were to do it over again, I would break up the work that needed to be done differently, creating shorter projects or “sprints,” each with a definitive beginning and end. And, I would not introduce the concept of the levy to the bulk of the staff until about 18 months before the election, to ensure the energy we were building could be sustained until the end. Because we are libraries, we must be thoughtful and careful with the funds we have been entrusted with. Because of this, we focus a lot of energy on creating tools that empower staff to do the best work possible. Nothing beats word of mouth! When we are trying to push out past the reach of our staff and partnerships, we rely heavily on social media. Here in Kitsap, in the shadow of Seattle, there are not many media options that reach our county. Social media is by far the most cost-effective way to reach very targeted audiences. In our levy campaign, we worked with Harstad Strategic Research to survey a segment of our community that was representative of the whole, testing our messaging and assumptions and ensuring we talked with nonusers. Confident in our message, we relied on paid social media and close local media relationships to further our reach. We also leverage email. In our organization, new cardholders are automatically opted in to our list; our unsubscribe rate is very low. And, another benefit of mapping our community was the beginning of something I have been trying to do for some time. We built a separate email list of our community partners, leaders, and stakeholders and have segmented it in several ways, so that we can message these segments differently than we do to our patrons—as partners in the betterment of our community. Be curious. Pick up the phone and ask. Kitsap Regional Library would not be where it is now without the support we received along the way from so many others. I think I spent the first 6 months of my career in libraries digging into what others were doing, and when I was inspired, I would call them. In every single instance, my fellow marketers were welcoming and generous with their time. We have the benefit of working in an industry where, in most cases, we are not competing with each other. We all influence the bigger brand of “Library,” so when one of us is better, we are all better. And, balance the flashy fun stuff with the real work. Most of what I do is research and planning. You have to love both. A fun campaign might get you into a library journal, but there is an opportunity cost to everything you do. Make sure the ROI is there.